First published as a novel in 1919, this path-breaking genre piece was praised by The New York Times, whose review of Merritt (1884–1945) is appended here. Also included in this new edition: a lukewarm introduction by SF star Robert Silverberg, who admits his “fatigue” of so many fantasy clichés found in Merritt’s other-world narrative. 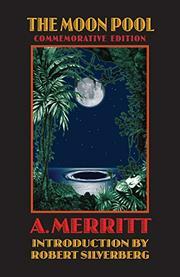 On the other hand, Merritt was among the first (with Verne and Haggard, whom he most resembles) to speculate in fiction about the implications of the new science, archaeology, and anthropology at the turn of the century. This faux memoir records a botanist’s tale of life in a lost “Atlantis” in the Pacific, a fantastic nether world controlled by forces of electricity and magnetism. The stock characters—from a chatty Irish adventurer to a scheming Russian scientist—bring to life a story that resembles too many movies to name. And scriptwriters might still find much to mine in this entertaining ode to love and sacrifice.